The National Appliance Energy Conservation Act of 1975 (NAECA) was enacted to help create uniform appliance efficiency standards at a time when individual states were creating their own standards. The NAECA established a conservation program for major household appliances, however no real standards came into existence until the 1980s when appliance manufacturers realized it was easier to conform to a uniform federal standard then individual state standards. The National Appliance Energy Conservation Act of 1987 amended the Energy Policy and Conservation Act and was introduced and supported by democratic Senator Bennett Johnston, Jr. from Louisiana in January 1987. The new amendments to the act established minimum efficiency standards for many household appliances. These standards were put in place to ensure that manufacturers were building products that are at the maximum energy efficiency levels are that are technically feasible and economically justified. The U.S. Department of Energy (DOE), as part of the NAECA issued Final Rule energy efficiency mandates in April 2010. As a result, on April 16, 2015, the new requirements call for higher Energy Factor (EF) ratings on virtually all residential gas, electric, oil and tankless gas water heaters. The NAECA rulings are important to customers because they reduce energy usage and save money all year long. According to the U.S. Department of Energy website, standards mandatory in 2015 will save approximately 3.3 quads of energy and result in approximately $63 billion in energy bill savings for products shipped from 2015-2044. These far-reaching new requirements will have important impacts on water heating manufacturers, distributors, installers and consumers. These regulation standards will be mandatory in Northern Colorado, which includes all of Larimer, Boulder and Weld counties. The new water heaters have to accommodate the higher insulation r-values, or thermal resistance, which will make the water heater typically 1-2 inches taller and up to 2 inches wider. In some cases, the water heater will have to be relocated to operate properly, or mitigate noise. While the operating cost of the new water heaters will be less because of their increased energy efficiency, it is likely that the maintenance costs will increase because of a more complex design, and the integration of electronics, blowers, fans condensers, etc. The new water heaters are expected to be 20-30% higher than the price of a current water heater. 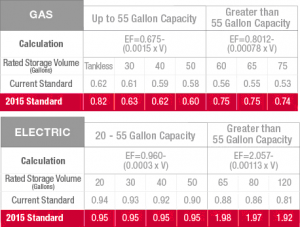 In some cases, other installation costs may be required to adapt to the new water heater’s size and efficiency installation requirements. To find out more information or to schedule a new water heater installation, call us today at 970-667-0300. We service the Northern Colorado areas including Loveland, Fort Collins, Berthoud, Longmont, Windsor, Greeley, Evans, Johnstown, Milliken and Estes Park.